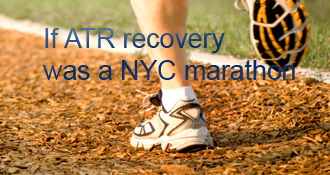 ryanbsd has completed the grueling 26.2 ATR miles to full recovery! Even though my tear and surgery feel like a distant memory, it’s hard to believe it’s been 10 weeks already. My doc’s aggressive recovery program has worked like a charm - I’ve been weightbearing since week 2 and boot-less since week 4 - and haven’t had so much as a close call with my Achilles (even with a now-walking 11 month old and her assortment of booby traps around the house). I can do 2-footed heel raises and am thisclose to being able to support my body weight on just my injured Achilles. Taking a step back, I can’t believe how far I’ve come in such a short time. I’m not sure I’ve ever felt as helpless as I did during those first 2 NWB weeks post-op, but here I am 8 weeks later where if you didn’t know I tore my Achilles, you wouldn’t be able to tell just by looking at me. I’m not sure what I would’ve done without the wealth of information and positivity on this site in the days and weeks right after my rupture, so if you’re reading this having just joined the “club”, hang in there because there’s light at the end of the tunnel. Even though I’m nowhere close to returning to the basketball court, I’m making progress and I gotta say, it feels good! After heading to the emergency room that night to confirm what I already knew, I found my surgeon and had my surgery 6 days post-rupture. The surgery went fine, the tendon was sewn up and reinforced it with 2 anchors into my heel to add extra strength as it heals. I had a surprisingly low amount of pain after the surgery and the only real discomfort was resting my heal on my pillow due to the anchors. Fast-forward to today and I just hit 3 weeks since my surgery and am making progress. So far, my surgeon’s been super aggressive about my recovery: after 2 weeks NWB, he removed the stitches, put me in a boot and told me to put as much weight on it as I could tolerate. He also referred me to a physical therapist for ROM exercises with the goal of getting me out of the boot and back into 2 shoes at my next follow-up (which is less than a week away). On one hand I’m excited (I get to wear shoes again!) on the other, I’m scared. to. death. of re-rupturing it. Having read many of the other blogs on this site, this seems like a REALLY aggressive recovery timeline and I honestly wouldn’t mind it too much if he called an audible and kept me in the boot for another week or 2. That said, my surgeon came highly recommended for this surgery so I’m wondering if he’s just a bit on the cutting edge here and if this is a lot of worry about nothing. My achilles/ankle/foot feels pretty good, but I know that’s fool’s gold at this stage so I’m not putting too much stock in it. Now that I’m past the doldrums of NWB, my ultimate recovery goal is to get back on the basketball court in the next 6-8 months, but only if I’m ready. A few lessons I took away from my recovery: an iWalk and knee rover are absolutely worth the money if you can afford it, I used the iWalk throughout my NWB phase and it was amazing being able to maneuver around the house and have use of both hands (I barely touched my crutches). The knee rover is still in use for work, shopping, and other errands. Above all, I’m thankful for an extremely supportive wife who has unexpectedly been forced to deal with 2 babies now (in addition to the 9 month old that was there before I got hurt) and has done so with little visible resentment at having to change diapers and change ice packs exclusively for 2 weeks. That’s it for now, but I’ll update this after my next doctor’s appointment to see whether he (I?) actually went through with getting out of the boot. Hi all. Been a month since logging in. Things are going very well. Ended up being nwb for 6 wks. Went into pwb by using crutches tho walking in shoes. FWB at wk 8 and started pt. PT has been great. I was getting tons of swelling at first but has gotten better each day. Hardly any swelling now and tomorrow marks my 11 wks post op. Went back to work with no restrictions at wk 10 but have still been taking it easy. Limp is almost completely gone now thanks to pt. Scar was real tender at first but that has now gotten progressively better each day since pt. The atrophy is still very noticeable. Doesnt look like i have a calf muscle still but things are getting better and leg is weak but getting stronger by the day. Was told can start jogging beginning of Sept which should be roughly at 13 wks. I remember reading this site wks ago lying on the couch with my foot up thinking how bad things were. Now I sit here thinking how great things are going. @softballcas… so how is things going? Are you walking on your own? I am week 6 and 3 days. I’ve been in my boot since week 3 July 10. I don’t see my surgeon until next week 7. I also start therapy next week 7. I’m hoping my surgeon will tell me some good news. Thanks for the responses. I definitely have the concerns of landmarks of when I should being doing and not doing. I guess because of the strength in my leg was his thinking but i still think there should be something. I have expectations of being active again as I am only 37 yrs old and far from wanting to be inactive. His plan is for me to be walking on my next visit which is a week and a half away. I’m sure I will be but definitely dont want to over do it. Hey softballcasualty - I completely agree with cserpent - PT is pretty crucial (especially in the early WB weeks). Mine has been great in providing the right exercises at the right time to build up strength and flexibility, as well as the massage work that loosens up the scar tissue to help with mobility. Hey softballcasualty - I would ask him why he thinks you won’t need PT?? Now, depending on who your insurance is with the PT can vary greatly. Kaiser is more of the here are the exercises, let’s review them while you’re here, now go do them on your own and come back in X weeks for the next set. But if you have questions or concerns you can email or call and get answers. Other PT is quite interactive and you visit 2-3x/week and get massages, … I, personally, think PT is a must. For starters they dial you back from overdoing it. Secondly they give you a list of things you should do with a schedule. Otherwise the tendency is to just do “whatever” which may mean a lot of nothing or to overdue it which may mean messing things up. So - speak up for yourself and tell your doc you feel much more comfortable going to PT since you don’t want to mess things up and you do want to get back to normal strength and flexibility. Hi Ryan. Great to read things are going so well. Just had my 6 week appt. I ended up doing 6 weeks NWB which was miserable to say the least. Doc has me PWB for the next 2 wks though I’ve already been walking some on my own. The interesting thing that happened to me was the doc had me pushing on his hand so he could check strength in the leg and tendon. After doing this he said that I am not going to need PT. I was a bit surprised to say the least as everything I read talks of everyone doing PT. Not sure what my point is here just wondering if anyone else has had an experience like this? Glad you’re doing well Ryan! I’m at week 18 and I see progress week by week. One week I can’t do 10 1 footed calf raises and the next week I can. Last week I couldn’t run 1/4 mile without pain (so my PT said run 30 seconds, then walk until the achilles is happy again, then run 30 seconds, … I was doing that for 1 mile) and today I tried the 1/4 mile again and had no pain in my achilles but my IT band and gluteus medius (which is weak still) had me stopping after the run so I could foam roller the side of my leg - LOL! Just finished up my 2 week appt. Got stitches out and can actually wash my foot now. Still in the splint but has me moving my foot up and down now 100 times daily. Dont go back for 2 more weeks now. Not as aggressive as your timeline but its something. I’ll just keep taking it one day at a time! Keep your head up, the first 2 weeks post surgery were by far the toughest for me. To give you a sense of my timeline: At week 2, I got my stitches out, got into a boot, and started PT. At week 4 I was out of the boot and into 2 shoes (I’m at week 6 now). Starting to weight-bear and going to physical therapy have been huge mental boosts so far. Re: the umbilical cord; very interesting, I’ve never heard of it before but it sounds like it would make for a really strong repair. My surgeon anchored the repair into my heel bone for added strength, which I suspect is why he’s been so aggressive with my recovery. One other thing I forgot to mention in my earlier posts, my AT surgery was performed using an umbilical cord to make it heal faster. The uc was wrapped around the tendon where attached. Has anyone else had this done that would like to comment in the healing process? Great to read your doing so well! Gives me some hope for the near future. I have my 2 week appt in a couple days and will be getting the stitches removed. If i read correctly is that when you were given the boot to wear? My doctor told me i would be back to work in 8 weeks so I’ve just been trying to envision what i have in store for me and it seems like a similar pace your on. That’s amazing, Zoomie! I haven’t used the crutches since I got past my NWB stage either (I’ve heard it’s good for the leg muscles). I don’t know how you went 6 weeks NWB straight to walking a 1/2 mile the next day. At my current walking pace it would probably take me a day and a half to get that far. Awesome to hear about your minimal limp, I’m still limping a decent amount due to stiffness & lack of calf strength, but it’s getting a little better every day. Congrats on 2 shoes!. Wow your physician is super aggressive. Your body will tell you - use a cane or one crutch initially until you feel comfortable. My was an aggressive protocol as well. 6 weeks NWB in the cast then straight into shoes FWB bypassing the boot all together. Surgeion used the same reassurance words. New procedure is strong and unless I fall off the stairs I am not going to rerupture tendon again. Day 0 after cast was removed I used crutches for about 2 hours then tried without and have not gone back. I walk barefoot on a hardwood floor at home. And use 1.5 inch heel risers in my running shoes when walking outside. Day 2 walked 1/2 mile in the morning and 1 mile in the afternoon. Day 3 was a private PT day. I found a specialist in sports injury recovery - his massages are deep and really help to get blood flowing and warm up before ROM exercises. Day 4 - private PT again. When I was leaving the guy told me - Loose your limp you are ready - don’t drag your feet - bend in the knee and push off. Make smaller steps but with the correct gait. Yay for 2 shoes! Congrats on reaching another milestone on the road to recovery! Thanks guys! I just had my 4 week follow-up today and was cleared to go back to shoes! I didn’t feel ready when I woke up this morning, but the doc assured me that unless something drastic happens, like falling down some stairs, there’s no increased risk of re-rupture for me at this point. Apparently the new more aggressive surgery/recovery protocol has been really successful on this front. I’m sure many will be waiting to hear if the super aggressive plan works for you! Good luck to you and so glad you have a supportive wife! My hubby was wonderful as well - his motivation was get me well as fast as possible so he helped me follow the docs instructions by letting me be a bed potato for the 2 weeks I had to elevate 90% of the day and keeping me regularly supplied with ice packs. And his support has helped me be on the fast track for healing so far! And, as PJ said, listen to your body. If your body doesn’t want to be on quite as aggressive a schedule let your surgeon know you’re slowing things down. That does seem quick (no boot at 4 weeks) but if I’ve learned anything here, it’s that there are as many timelines as there are blogs. I think your body will tell you…it’ll either feel right or it won’t. That’s the only way I can explain how I’ve reached the different milestones. Up until a certain point, something like weight bearing or stretching or walking in the boot would feel impossible, and then one day it felt like the right time to try. Good luck with the recovery (and babies) and let us know how that next appointment goes! ryanbsd’s AchillesBlog is proudly powered by WordPress and WPDesigner..